Enjoy the chill in air for the time being instead of fretting over the sultry summer that will follow the brief winter season in city. By the time summer sets in, you may have a new jacket in your wardrobe to save yourself from the heat. Solar expert SP Gon Chaudhuri and scientists of the SN Bose National Centre for Basic Sciences are working on the final stages to introduce solar jackets some time next month. Gon Chaudhuri, the former advisor to the state power department, said the prototypes had already been prepared and will be launched officially in the first week of January. "We will do an extensive research on how to give these jackets a smart look. One city-based company has already approached us to have a look at the prototype," Gon Chaudhuri said. The price of the jackets also will also be very reasonable. They will be priced anything between Rs 1,400 and Rs 1,800. 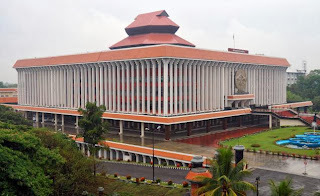 The five electricity supply companies (Escoms) in Karnataka are working out modalities to tap the surplus solar power available with industries and domestic consumers. They are planning to approach the Karnataka Electricity Regulatory Commission (KERC) to fix the tariff for such power generators. 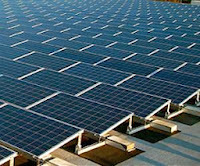 Many individuals and industrialists have installed solar panels in their homes and factories. During an interaction on Saturday with bulk consumers in the Bangalore Electricity Supply Company (Bescom) jurisdiction, Principal Secretary of Energy Department Amita Prasad said that smart meters and hybrid power are the way forward. “Excess energy from rooftops can come to the grid,” she said while responding to a suggestion from an industrialist in this regard. 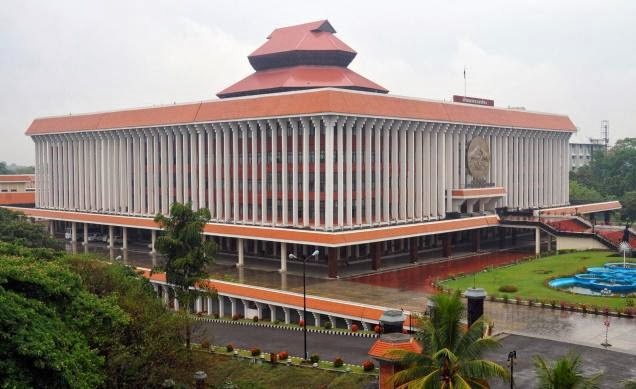 She said that alternative energy sources, especially solar power, will be considered in the light of the ban on development works in the Western Ghats, which has the potential for several mini-hydel power projects. 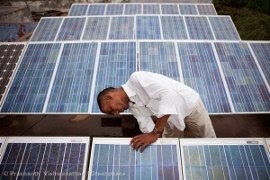 Indicating better sectoral prospects, India is projected to see a solar power generation capacity addition of 1,750 MW next year, says a report. 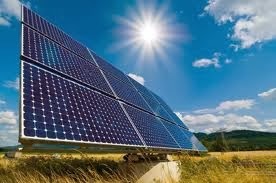 Noting that new solar installations so far this year have been around 900 MW, Mercom Capital Group today said that India is not likely to register any significant year-over-year growth for 2013. 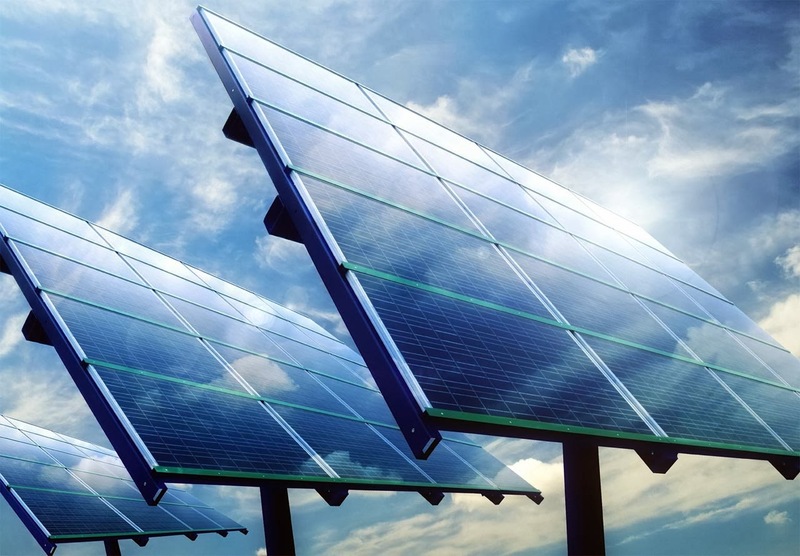 However, during this period, global solar market is estimated to see 20 per cent growth. 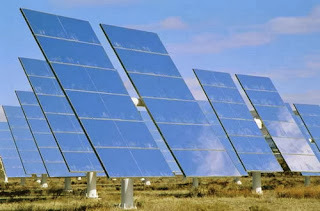 "... our preliminary estimates are tentatively at 1,750 MW of solar installations in India for 2014. "Although the projected installation growth looks impressive, it includes 420 MW of CSP (Concentrated Solar Power) projects that did not get installed in 2013," Mercom Capital said in a statement. Going by estimates, the operational capacity, comprising solar photo voltaic and solar thermal, is little over 2,000 MW. As per Mercom Capital, the domestic solar industry has seen high inflation with about eight per cent increase in module prices. To boost solar power generation in the country, the government in 2010 had launched the Jawaharlal Nehru National Solar Mission ( JNNSM). This programme aims to have 20,000 MW of grid-connected solar power by 2022. India has an overall installed power generation capacity of more than 2,27,000 MW, with renewable sources accounting for over 28,000 MW. Bharat Heavy Electricals Ltd. (BHEL), India’s largest power-equipment maker, plans to invite bids by March to build a 1-gigawatt solar plant as the government seeks to cut the cost of the technology by promoting large projects. State-owned Bharat Heavy, leading a six-company joint venture, intends to auction a contract for the design and construction work in the next four months, said Tarun Kapoor, joint secretary at the Ministry of New and Renewable Energy. India, which suffers from peak-hour power shortages of as much as 25 percent in some states, is starting a program of large-scale renewable projects to diversify its energy mix and reduce a current-account deficit exacerbated by fuel imports. The country has proposed to build five so-called ultra-mega renewable parks comprising as much as 18 gigawatts in capacity over about 10 years, according to a ministry presentation obtained by Bloomberg News. 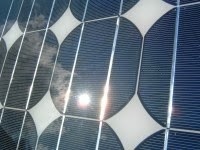 That would expand India’s installed solar capacity ninefold. Bharat Heavy’s planned tender will award a contract for the first gigawatt of a proposed 4-gigawatt solar park at Sambhar, Rajasthan state. The remaining capacity will later be auctioned in 500-megawatt batches to non-state developers, Kapoor said. A working group representing solar industry stakeholders has developed standard contracts that should help lower transaction costs and make it easier to access low-cost financing for residential and commercial solar power projects. 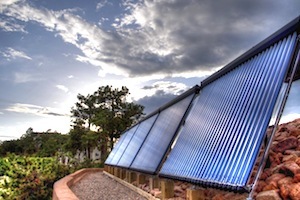 The Solar Access to Public Capital (SAPC) working group, assembled by the Energy Department's National Renewable Energy Laboratory, is a consortium of solar energy developers, law firms, financiers and analysts with expertise in solar energy projects. The contracts cover residential leases and commercial power purchase agreements (PPAs). The working group members recognized that customizable contract templates could improve consumer transparency, increase private-sector investment, and lower the cost of solar energy to end-users. "These template contracts should allow national and regional solar developers alike to increase business opportunities and enable the creation of tradable investment vehicles desired by pension funds and other institutional investors critical to scale the industry," NREL Energy Analyst Paul Schwabe said. "This effort is just one of the many ways that the partnerships forged across the SAPC initiative are helping to unleash cost-competitive solar power." 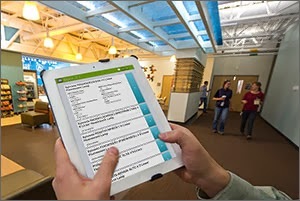 NREL initiated the SAPC working group effort in October 2012. Since then, it has grown to include more than 120 member organizations. The working group is also engaged in several activities designed to build investor confidence, including collaborating with rating agencies to evaluate "mock" portfolios of residential and commercial assets, developing best practice guidelines for system installation and operation and maintenance, and developing a system performance dataset. 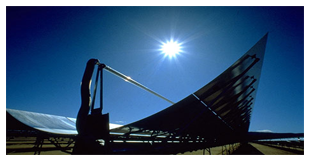 The three-year effort is funded under the Energy Department's Sunshot Initiative. A group led by New Generation Power LLC, a U.S. clean energy developer, has signed contracts to build 315 megawatts of solar plants in India. 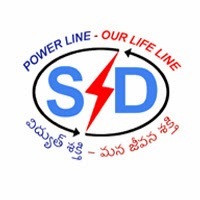 The group expects to invest $400 million by the end of 2014 to complete installations at various sites across Andhra Pradesh state, Chicago-based New Generation said in a statement. The plants will sell power under 20-year contracts to the local utility. 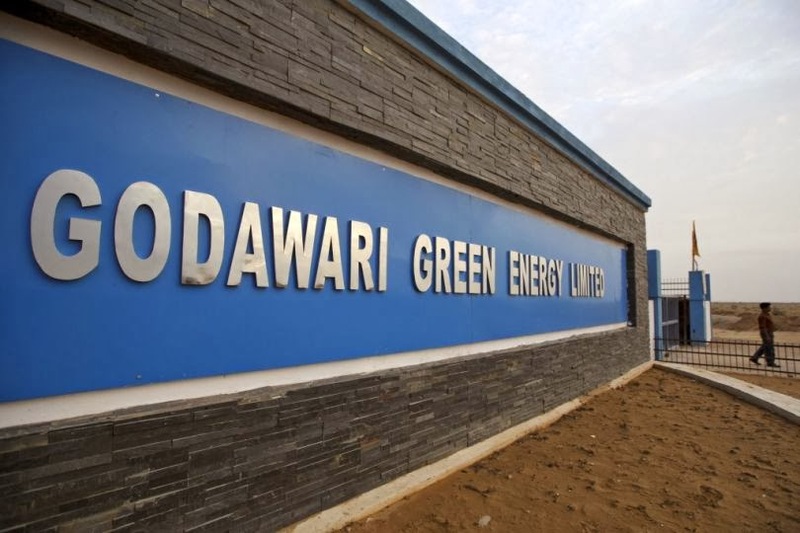 Mumbai-based Waaree Group and Hyderabad-based Premier Solar Group have been selected as contractors to design and build the plants, according to the statement. 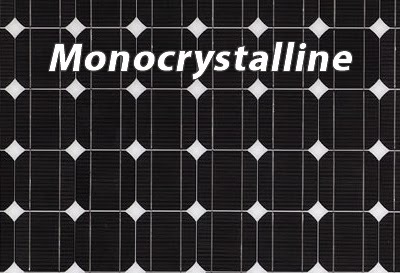 Monocrystalline cells are cut from a single crystal of silicon- they are effectively a slice from a crystal. In appearance, it will have a smooth texture and you will be able to see the thickness of the slice. These are the most efficient and the most expensive to produce. They are also rigid and must be mounted in a rigid frame to protect them. 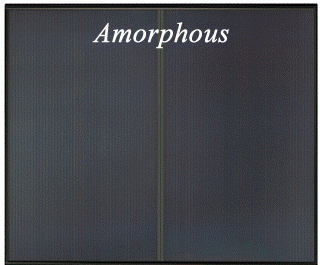 PV cells are made of silicon, similar to that used in computer "chips". 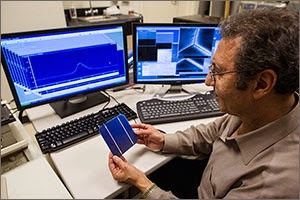 While silicon itself is a very abundant mineral, the manufacture of solar cells (as with computer chips) has to be in a very clean environment. This causes production costs to be high. 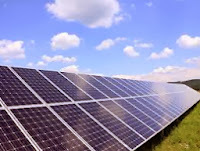 A PV cell is constructed from two types of silicon, which when hit by solar energy, produce a voltage difference across them, and, if connected to an electrical circuit, a current will flow. 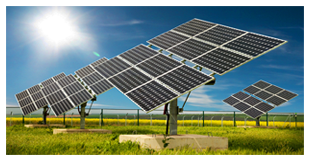 Photovoltaic cells or panels are only one way of generating electricity from solar energy. They are not the most efficient, but they are the most convenient to use on a small to medium scale. 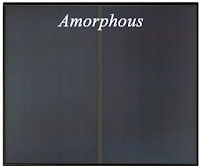 A number of photovoltaic cells will be connected together in an "Module", and usually encapsulated in glass held a frame which can then be mounted as required. The cells in a module will be wired in series or parallel to produce a specified voltage. What may be referred to as a 12 volt panel may produce around 16 volts in full sun to charge a 12 volt battery. In most cases, a number of panels (modules) will be connected together to form an "Array". Panels of a similar type may be connected in series to give a higher voltage (two 12 volt panels may be connected in series to produce 24 volts). Usually a number of panels will be connected in parallel to give an increased current. SPV System design, installation and service. SWHS design, installation and service. 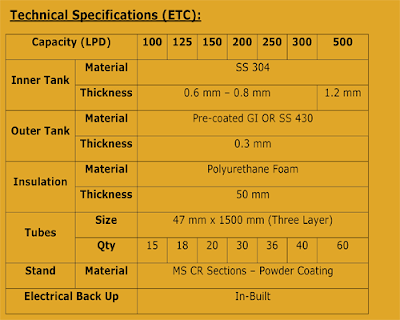 Greentek having total production floor area of 80000 Sq Ft at various locations in India. 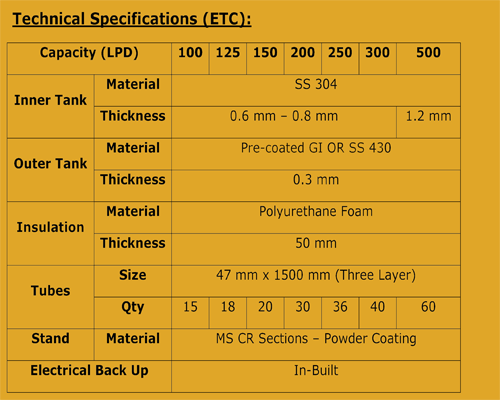 Greentek having automated manufacturing facility for Tanks fabrication and collectors. Greentek have a strength of about 90 skilled & technically qualified work force with an installed capacity of 60 Lakh litres of Solar Water Heaters and 15 MW of Solar Modules per annum to support our growth plans. We are committed towards our clients by building long term, quality relationships and provide intelligent solutions to water quality issues through technical application assistance, and the sale of superior quality products. 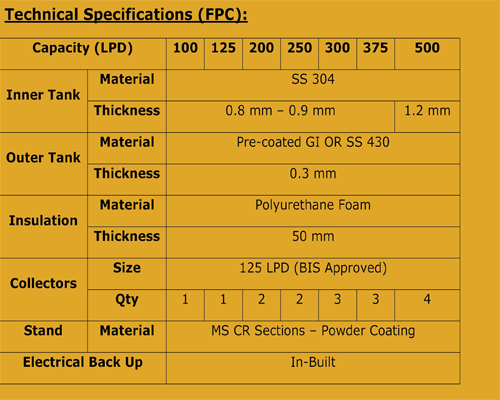 We give utmost importance to quality and it is never taken as chance. In maintaining the quality, we conduct stringent check at each level of manufacturing and assembling process. We procure quality water processing machineries and customized it according the requirements of our clients. Our quality check measures conforms to both Indian and international standards as per BIS (IS:12933) and ISO 9001-2000 quality standards. 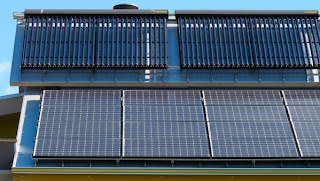 Solar Thermal and PV should not be seen as competing technologies or products as they perform different functions and as shown below can be installed together to provide a well balanced solar energy harnessing system. Electricity can be used for almost any application, and so is a universal energy source. Heat is required for hot water and space heating which represent a large % of a household&#39;s total energy requirements. When light energy is absorbed by a material known as a semiconductor, an electrical charge is created, this property of the material is known as the photoelectric effect. Silicon is the most common semiconductor used by PV cell manufacturers. 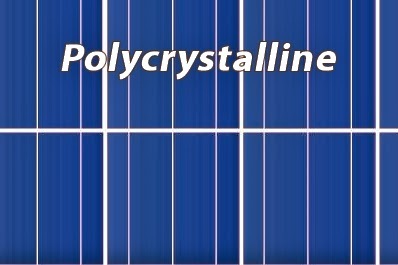 Stand alone PV systems are not connected to the grid. 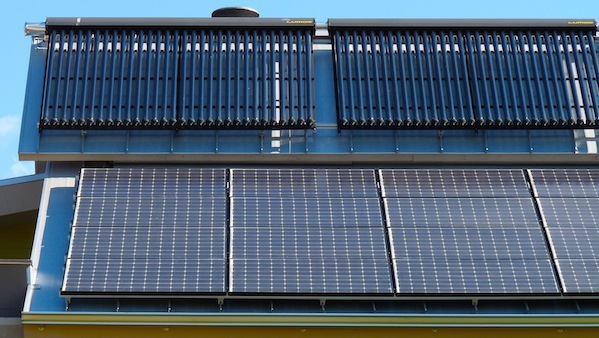 Stand alone systems are set up so that you use the electricity produced by the PV system directly. In order to take full advantage of the electricity produced, it needs to be stored. For this reason, a standalone system will commonly include battery storage.